A large movement is afoot. People from cities, to towns, to back out in the country are clamoring for egg chickens. There is an appeal to having chickens. On first glance, they appear to be quaint, utilitarian and simple. Hipsters from all over are getting egg layers for their city rooftops, and suburban side yards. In general, I think it is a great idea. More people should take direct responsibility for feeding themselves. More people should understand that chickens are living beings, not commodities to be used, expended and then thrown away. Any true introduction to chicken-ness is good. Every animal you care for winds up teaching you lessons, some good, some not so good. The good is really quite obvious. Chickens are waste conversion engines of the finest kind. Inputs are seeds, grains, bugs and kitchen scraps. Outputs are eggs and amusement. Chicken TV if you will. I could spend hours just sitting watching them. They have personality and social structure. I also watch bee TV. Call me nuts, but I don’t watch real TV anymore (a whole separate blog entry) so I have to do something lazy. The bad part about this chicken business is that folks don’t really know what they are in for. You are signing up for such lovely things as vertical poop, that is poo on the wall about 4 ft off the ground and not near a perch or nest box, but somehow there is poo four feet up on that wall. Segue to manure handling or mucking out. A job I never do on my farm since we run our floorless chicken schooners up and down the hayfield. 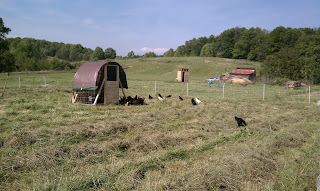 The chickens oblige by fertilizing my hay field for me, and I oblige by not shoveling any manure. Breaks my heart. However, chances are slim that city ordinance will allow chicken tractors to be moved up and down your yard in suburbia. The coops are required to be permanent and match the house. Then, one may have no roosters in general. Quarter acre lot subdivisions are not conducive to Mr. Roo waking the neighbors at 4AM. And there is the big ugly specter looming in the corner. Egg hens lay well for about 4-6 years. Most municipalities prohibit animal slaughter in your yard, so what do you do with old Henrietta and she has passed her prime? What if you have no constitution for dispatching the animal? I’ll tell you what happens. Folks drive by your farm and throw chickens at you. Yes, you stroll around one morning to see that stranger-chickens have showed up, roosters that you neither asked for nor wanted. Perhaps someone was to soft hearted to slaughter their own birds, or was prevented by ordinance. Perhaps their children wouldn’t let them do it. “Here dear lets put the roosters out on this farm to retire”. Need I remind you that we are a working farm? We let the roosters live a very happy, contented chicken-life. They roamed freely, they ate feed, and they ate bugs. They were delicious.